Your audience has become more sophisticated and increasingly mobile. To adapt, you should explore new and different communication platforms and methods for your marketing programs. Begin by maximizing the impact of your webinar programs by utilizing the right platforms and best practices for delivering live webinars and on-demand video presentations. 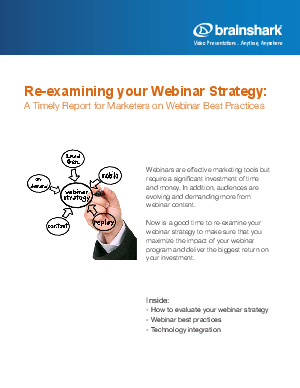 This report explores picking the right webinar strategy for your goals, webinar best practices and technology integration.